free municipal compost, worth it? Hello all, I have a question about free compost from my city. In the town I live outside of they pick up leaves, yard waste and wood and chip it etc. They have a spot that they compost all the organic waste and they let the public have it if they want. it does have some bits of trash mixed in on occasion that you have to pick out. Does anybody else use this kind of compost from there city? If so how is it? My only concern is if there are a lot of weed seeds still left or not. Thanks all. Re: free municipal compost, worth it? We have a municipal contractor that the city pays to take green waste and turn it into compost. The facility composts the green waste and also takes untreated pallets and logs. The quality depends on what people put in their trash cans and how well the material is composted. The facility sifts;grinds; and turns the windrows four times. They post their analysis online. The result is a compost that on the last analysis had a pH of 8.13. The pH is higher than it used to be because they are selling the compost younger and a few times we got compost from them that was still cooking so we had to let it sit a couple of months more for the actinomycetes to die and the compost to cool off. I cannot use this compost on plots that are already alkaline pH 7.8 so I can only use it in my acidic plot at home. 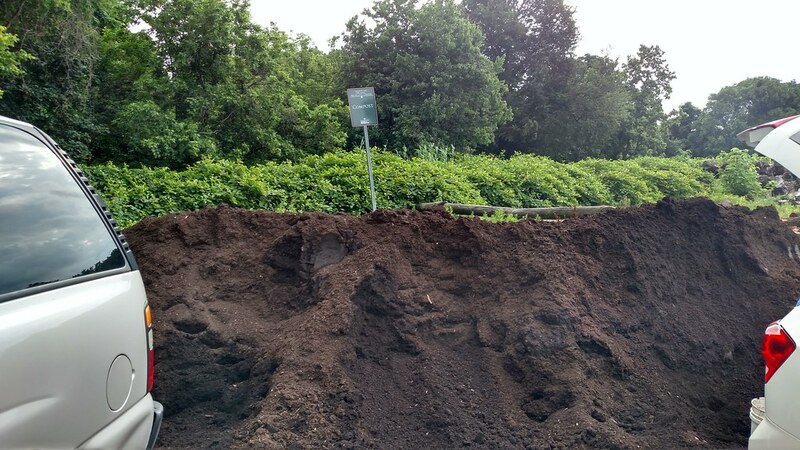 After the compost has been sifted for the fourth time, the parts that did not break down are the parts that they put in piles as free mulch to the public. This pile does have things like wires, plastic and other rubbish. I will eventually turn to compost but it would take longer. The quality of the compost depends on how it is made and its maturity but also on what goes in it. The problem with municipal collections are that people put in stuff they should not like perennial weeds (nut sedge), tick seed, Coster's curse, California grass and some other seeds that can survive composting. The worst though would be people who use weed and feed on their grass. Those clippings should not go into the green bin because when people use the compost they have problems with herbicide damage to their sensitive plants. Most of the compost and mulch is good and if you have the right plants they don't seem to have a problem. The city compost is used a lot at the community garden and the plants grow fine. My mom uses the compost and she says she has had some weeds pop up from the compost. I have weeds from the mulch which is dropped off by tree trimmers and since I don't know which is good and which is not, I ended up with some nasty weeds from the mulch. However, I really like pine needles. For me they are the best mulch for weed supression for most of the plants except the onions. The other mulches invite the weeds. I've never looked into this, but I've wondered about it, because I've gone around neighborhoods and picked up bags of leaves that people leave out for city pick-up. (Around here we have three trucks pick up trash, i.e. garbage, recycling and yard waste). I've wondered what they do with all the plastic bags that people put their leaves in, but what's worse, some people get trash mixed in with their yard waste and it can be a lot. I've learned when I go around to pick up leaves, to stay away from trashy neighborhoods, the cleaner neighborhoods tend to only have yard waste, but the trashy neighborhoods tend to have a lot of garbage mixed in these bags. I have yet to try and get compost from the city. Before the city went to autmated collection and green bins, green waste was collected in bags manually. The compost was sifted and sifted out the plastic, but the remnants of the bags would be in the free mulch and would have to be raked out. Usually what we did was bring a 5 gallon bucket and a 1/4 inch mesh screen with us. We sift through the mulch and sift out most of the rubbish and we just kept the compost that remained. It takes some time at the pile, but we get pretty good compost that way for free. With the automated collection, bags are not allowed so there is less plastic in the mulch now. The city still has some folks on manual collections since their streets were too narrow for the garbage trucks to navigate so they still collect their green waste in bags. Some other comercial places also collect waste in bags. The recycling facility takes it and charges them a higher tipping fee. My city composts yard waste and also adds clean unpainted drywall and lumber scrap. The gypsum in the drywall is supposed to help with our heavy clay soil. Compost operations like this are usually hot so you can expect weed seeds to die in the process. Mine comes very well sifted and I've used several tons with no apparent change in weed population. I say that knowing I have tons of weeds so take it with a grain of salt. A little trash is inevitable. Screening helps separate that stuff out but in a large operation there is only so much they can do. The plastic bags are likely landfilled and all you see are scraps of torn bags. A couple other things about quality: they probably have a permit from the state to do a municipal compost operation, and it may have requirements for what they can and cannot put in, like painted and treated wood, trash etc. That should be a publically accessible document either from the city or state. Also, they may do tests now and then and post the results. My city does not test every batch but does have a couple samples posted online to give users an idea of pH, NPK, Ca, Mg etc. I pay $12/ton if I bring my own trailer on a compost sale day. And it's a generous ton. All in all, it's a great value especially if you need to treat an entire lawn or you're starting a garden area and need to till in a large amount. It's not loaded with nutrients but compost is mainly for improving texture and organic matter, not as a fertilizer. I of course make my own compost so this stuff is not all I'm using anyway. Here, the city actually pays the composter to proccess the green waste rather than to take up space at the landfill which has already had its limit extended. Your compost is cheaper than ours at $37 a cubic yard. It is still a lot of compost and a good deal compared to bagged products. The compost they sell is still immature and its' last test had a pH 8.13. It does get hot enough to start a few fires where the fire department was called out. What they can't control is what people put in their cans. Nut sedge survives composting. People using weed and feed products don't realize that the grass clippings are not compostable and the city does not want it in the land fill. There has been incidences of people using the compost saying their plants look sick, partly because of the residual herbicide and partly because the high pH raises the soil pH to a point where the plants have a hard time getting nutrients. Sometimes the compost isn't finished and it needs to sit awhile for the actinomycetes and smoking to stop. If the soil is acidic it can handle the higher pH but it does not help if the soil is already alkaline. I did not have the impression that unfinished compost is alkaline. It is possible the high pH in yours could be from another source. If the facility is using farm manure for example, it may have lime added to reduce odors in barns etc. As for the herbicides, consumer-grade ones are rapidly biodegradable. I would not use grass clippings that have been sprayed (i.e. Chem-Lawn) with herbicide directly as a mulch, but composting will take care of the most common herbicides, 2,4-D, glyphosate etc. However farmers have access to some persistent ones for use on pastures and they can survive horse and cow digestion to end up in manure. Chlorpyrifos and chlorpyralid. Google "killer compost" to read all about it. So if you get city compost with a very high pH or it makes plants sick looking, ask the city whether there is manure or other farm products in it, and whether anyone is checking these issues. Do keep in mind that unfinished hot compost can stress plants because the chemistry is not exactly what plants like - and it's not just related to pH. Warm compost is one thing but if it's steaming hot, I would let it finish in a pile for a bit. If I was tilling it into a bed in fall, no problem, it will be balanced by spring. But I might not plant directly in it if it was that hot. Figure I would add my 2 cents. I've used it before in years past. Last year I bought two yards of one of the commercial producers in the area. The commercial stuff looked a lot nicer and probably was. But its tough to say. The free municipal stuff almost looked like burnt leaves. Very dark but still having an unfinished look. I don't think it brought in seeds but I can't say for sure. My opinon would be that if it doesn't bring in seeds and is free, it is well worth the time to bring to the garden. Having a large and free supply of organic material for your garden is a good thing. So even if it isn't as good as what you make from your scraps, it is still mass amounts of organic matter to slowly improve your soil. The areas that I added this municipal compost to in 2015 looks really good. I have been picking up compost from our recycle center this season and it seems fine, 0 weeds so far. The cities around us pick up lawn waste but I've never heard of them offering it to anyone, free or not. I would love to get some but sadly it is not available. I have been using municipal compost from a neighboring city for years. They sell compost or wood chips for $10 a pickup load. It is a huge operation and have reported to sell 700 tons of compost in a weekend when they offer free loading. I have a 4'x 6'x 8' bin that I fill in the fall and use all the next year. They also give away biosolids ( milorganite type material) but I have only used that on my grass and ornamentals. Compost piles start out acidic and as the nitrogen and organic matter is broken down by the decomposers it becomes more alkaline. Most compost that we have tested is alkaline. Although the books said it is neutral. It does not test out that way. Compost may behave more neutral despite its' pH but the only way to know what it is for sure is to have it tested. Our compost may be more alkaline in part because of the feedstock. Green waste collection is every two weeks so greens in the can may not be very fresh. Most of the plants we grow here may not be very acidic. There are not a lot of pines or oak around and tropical trees are not deciduous. Most of the trees that are deciduous are non-natives. Turf grass here are usually not planted from seed because the grass is usually only planted once and the same grass will be around 20 years or more and often falling into neglect as most people will stop feeding and watering grass regularly after a time. The same thing happens with established trees. Mango, avocado, citrus, and other trees are not fed or watered regularly once they become established, so more nutrients leave them as people harvest fruit than is returned to them in the soil. They are usually only managed if the tree size becomes a problem or the fruit quality is poor. Leaves and branches from trees and landscape plants may just not be as nutrient rich to start with so there may not be as much nitrogen or acidity in the initial compost to maintain a neutral pH in the end. We also tested vermicast. Although the vermicast is fed mostly kitchen green waste, it also tested alkaline around pH 7.6. It may be because of high calcium that is naturally in the plants. To neutralize the vermicast, we added sulfur to try to get an end pH of around 6.0. I needed an acidic compost since the pH in two of my garden plots were 7.4 and 7.8. The last test, using the city compost that tests at 8.13, the pH of the garden has gone up to pH 8.1. It limits what can grow in the garden. My home garden is much richer in nitrogen so it actually tested last at pH 6.0. I have used chicken manure in that one garden for the first time in over 10 years to keep it from getting any lower. The alkaline plots got more alkaline. I peat moss in my community garden to lower the pH there as well. The herb garden will take a significant amount of sulfur to fix it temporarily. It is fungal dominant and in the long run, I have had to select plants that can tolerate the conditions. It needs regular intermittent applications of nitrogen since it cannot hold on to it for long. I have little choice but to use the city compost there. I don't have a lot of sources for good soil or other compost. We are trench composting now, but that takes 6 months to mature to a point where it can be planted and we only get one season of good growth. I have been getting free compost from the city for 40 years. 40 years ago it was all tree leaves but now it is ground up trees and leaves. A month ago I rented a trailer $40 for 4 hours to hauled 10 tons of compost to my garden. I won' be about to till it into my garden until soil dries out enough to till about MAY. It makes great garden soil. Free bat guano How to Compost it. Free class A compost I'm down wtih that!